For businesses and organizations, there is a growing and ever present need to protect documents and information from a catastrophic data loss. Failing to do so could cause more than just a lawsuit - it could lead to bankruptcy and bring your business to an end. In fact, 94% of companies that suffer a catastrophic data loss will not survive - 43% will never reopen and 51% will close within 2 years (University of Texas). Additionally, 93% of businesses that suffer a data loss for more than 10 days file for bankruptcy within one year - 50% will do so immediately (The British Chambers of Commerce). Making things even worse, 44% of these business ending disasters are cause by a system malfunction. Unfortunately, a data loss causing disaster can strike at any time and comes in many forms. Natural disasters, such as fires and floods, can physically destroy computers, servers, and backups leavings little to salvage. Human error can lead to misplaced items (physical and digital), accidental server wipes, and neglecting to backup the system. Not being prepared means that critical documents such as invoices, contracts, client information, financial records, reports, business processes and procedures, etc. can be lost and never recovered. Fortunately, there is a practical and cost effective approach to shield your business from a catastrophic data loss: an online document management system (or online enterprise content management). These systems provide off-site data redundancy, 24/7 infrastructure support, as well as offering numerous benefits and advantages over an in-house system. With a document management system your now electronic files are stored in a system that resides in an secure data center. This eliminates the need to worry about physical damage, upgrading server rooms, or updating software. All you need is an internet connection and your files can be accessed remotely through your web browser. Since you can work remotely, if your office ever loses power you can simply change locations and continue where you left off. 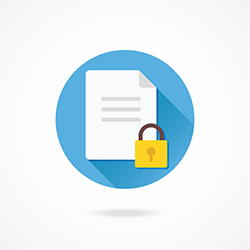 Because a document management company is keeping your files secure, their servers will automatically update software needs and backup your files to ensure their safety. A proper document management system will allow you to send links to documents with notifications to other users using the system, preventing crucial information from being missed or lost through a third-party email service. Every time a document is checked out, edited, and checked in, a copy of the previous version is retained, making it easier to monitor changes and follow compliance laws. This reduces human error by ensuring there is a copy of all previous versions in case someone deletes or wrongfully edits information. With an online document management system, admins can determine who can edit documents, who can view them, and who can or can’t have access to them. This prevents unauthorized access and minimizes the chances of something being deleted when it is still needed by your business.